The pennant chart pattern is a continuation pattern that often happen in the middle of a trend. Therefore, traders can take advantage of this pattern and use it to enter stocks. 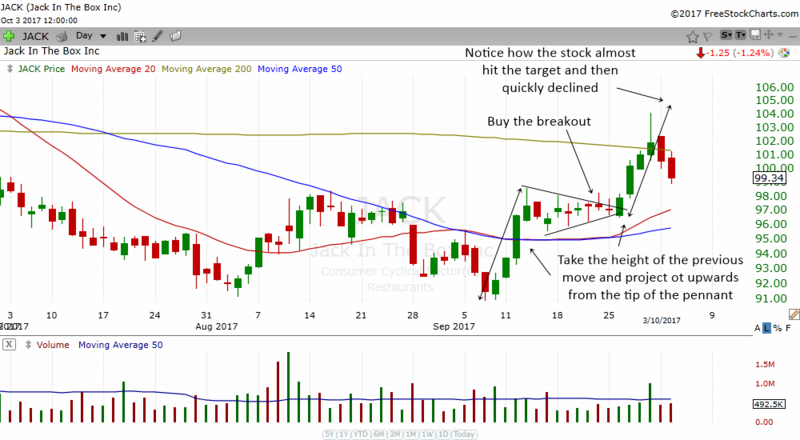 If you have missed a nice previous upwards move in the stock, you can still enter the stock when you see a pennant pattern developing in the stock. 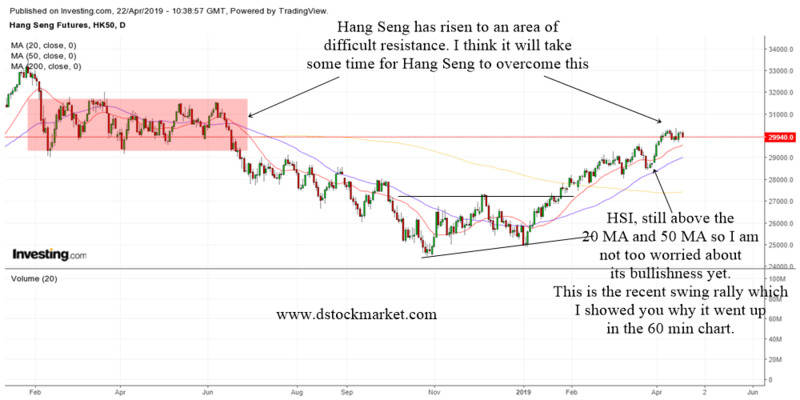 In this article, you will learn how to spot this chart pattern, how to enter the trade, how to put a stop loss, how to set a target and how to manage the trade. The pennant itself looks like a flag with pointed ends. It also looks like some type of triangle but the height of the pattern is much smaller than normal triangle patterns. The chart above shows how a pennant looks like. On the left is the bullish pennant and on the right is the bearish pennant. The bullish pennant appears after a nice upwards move and the stock continues to go higher as it breaks out from the pennant. With regards to the bearish pennant, the stock is already in a downtrend or experienced some downwards move. The stock trades sideways a bit and then breaks down below the pattern and continues to move lower. It is important to note that the entire pennant pattern is made up of volatility contraction. Notice how at the start of the pattern, the price is much wider? As the pattern forms, the price movement grows smaller and smaller until the two trendlines converge. There will be higher lows and lower highs as the pattern forms. The trader can easily draw two trendlines to form a pennant. The upper trendline will connect the series of declining highs while the lower trendline will connect the series of higher lows. When you connect the two trendlines, it makes it easier for us to spot the pattern because it will look exactly like a pennant. To be a valid pennant pattern, you need at least 2 highs and 2 lows. Usually the stock will form more than that. If you try to draw a pennant when there is only 1 high or 1 low then it may not be a valid pattern. The beauty of this pattern is it can give the trader a possible timing for the breakout. 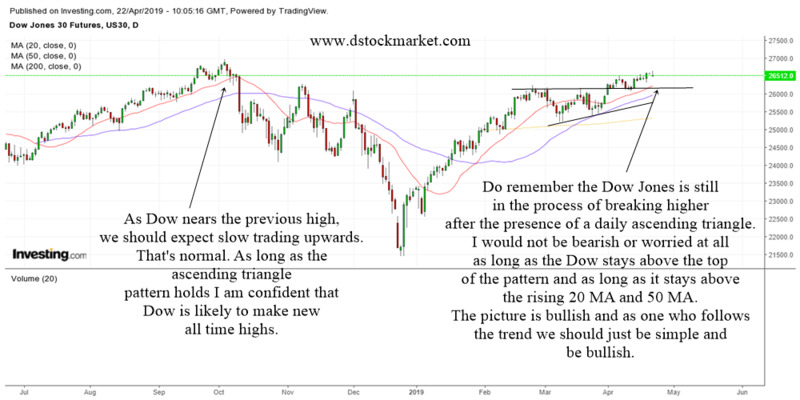 It is easy to notice things in hindsight but when you are in the heat of trading, it is often experienced traders who will be able to spot the pattern and take a position in the stock. 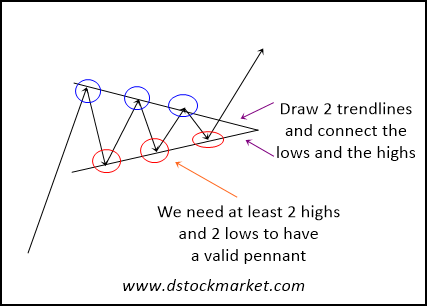 When there are 2 highs and 2 lows, the experienced trader will draw 2 trendlines. The trendlines will converge and the last 1/3 of the pattern is generally where the breakout or breakdown will happen. The pennant will not last forever and there will be a point where it will breakout. 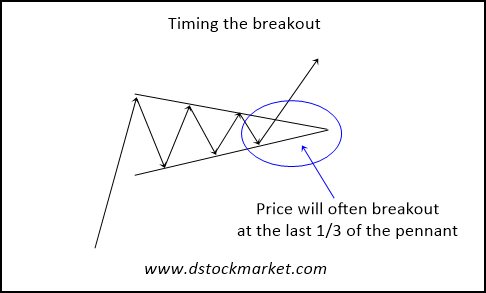 Using the last 1/3 guide will help the trader anticipate a breakout and plan his trades accordingly. When a pennant forms, we do not really know which way it will break out. The bias for the breakout direction is usually to the previous direction. That means that if the previous move is up, then the breakout will usually be to the upside. 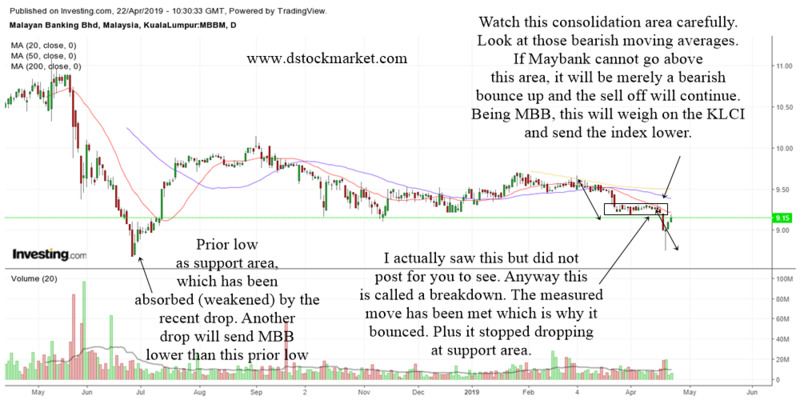 If the stock is in a downtrend and the previous move is down, then the breakout will be to the downside. The pennant can be a very lucrative chart pattern that you can trade. The benefit of learning this pattern also includes the fact that you can long or short stocks using this pattern. Therefore, you can take advantage of rising stocks and also profit when a stock falls. The chart above shows the daily chart of JACK. The stock had a nice run up in the second week of September 2017. The stock then drifted sideways and formed a pennant. The trader can buy the stock when it breaks the upper trendline. See how the stock shot up after it broke out from the pennant. The trader can set a target by taking the height of the previous upwards move and then projecting it upwards from the tip of the pennant. You can see how the stock almost met the target. Then it quickly sold off forming a topping tail pattern and proceeded to decline the next 2 days. Those who knew about this pattern and the target could have taken their profits or sold 1/2 of their position as the stock reached the target. Part of the trade management that a trader needs to do is to learn how to place protective stops and set targets. No pattern is perfect all the time. Therefore, a trader needs to be realistic and have a stop loss just in case the pattern fails. On the other hand, no stock will go up indefinitely. Which is why its good to have a target for the breakout. Even if the stock breaks down, it does not mean that it will go down forever. There will be times it may rebound back up and break through your stop loss. Trading is different from investing and the trader will do better if they learn to take some profits off the table when the target is met. 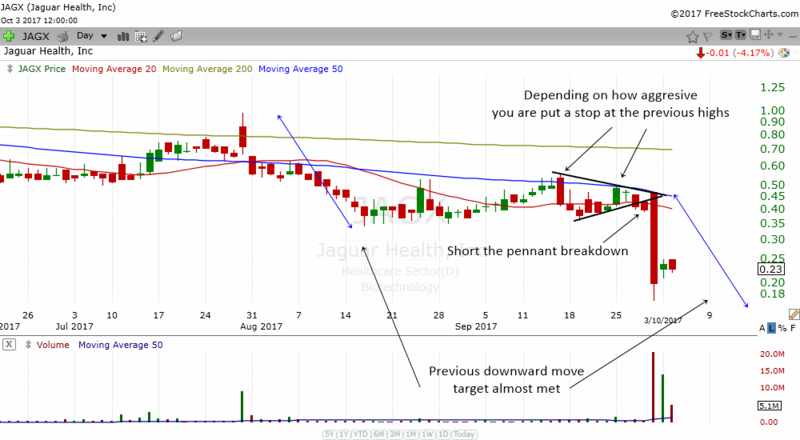 The chart of Jaguar Health shows an example of a bearish pennant break down. The stock was actually trending down and then it formed a pennant pattern. The trader can short the pennant when it broke below the lower trendline. The stock continued to drift sideways for one day and the next day it crashed down lower significantly. How do you set a stop loss? The trader needs to look at the upper trendline when it comes to a pennant break down. You can put the stop loss at the first high or the second high depending on how aggressive you are. The further away the stop loss is, the safer the trade will be from whipsaws. However, your reward risk ratio goes down. If you put a stop loss very near, you might be stopped out by whipsaws only to see the stock go down lower again. But if the trade works out well, you will have a bigger reward risk ratio for the trade. There will always be whipsaws and traders will not be able to avoid it. The important thing here is to set a stop loss at a comfortable level which you think the stock will not reach while balancing reward to risk. We have learned about this in the previous example, but let me just show you how to set a target again. This time, Jaguar Health is a pennant break down where you short the stock. It's very simple to get a target. Just look at the previous move down and then project it downwards from the tip of the pennant. The stock started to move down around August 31 and then it bottomed out for awhile on September 16th. That is the previous move. You take the height of the move and then you just project it downwards from the tip of the pennant. Notice how the stock almost met the target and then it bounce up the next day. Those who were short the stock could have covered the stock. Or they could have covered 1/3 or 1/2 and continue to monitor the stock closely to see what it will do next. Most of the time we think that the pennant is a continuation pattern. But did you know that the pennant can also be a reversal pattern? When the pattern appears at a support area, then it could be a very good reversal pattern that confirms the support area. The chart of KLAC above shows how the pennant can be a reversal pattern. The stock had a correction and dropped to the 200 MA area. The stock then formed a pennant and when price broke above the upper trendline in the pattern, it went higher. 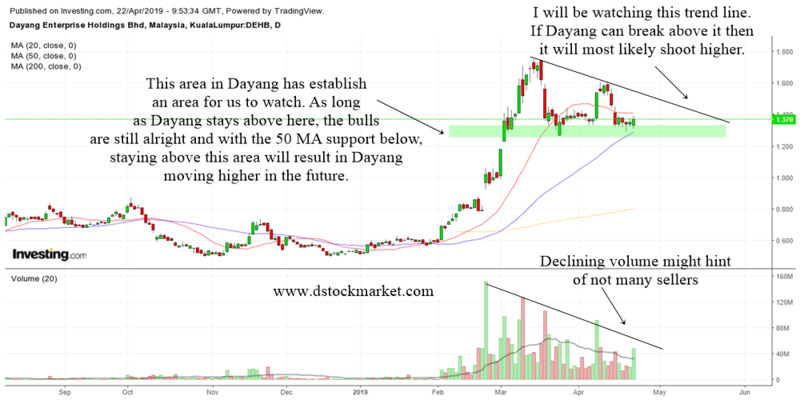 On the daily chart, the stock also broke a mid term downtrendline. This enabled the stock to go higher and higher. When the pattern appears at support area, it is difficult to use the pattern to set a target. The trader will need to use other methods to determine a target. They could be analyzing support and resistance and try and figure out if the stock can overcome the area. In the case of KLAC, the stock hinted that it could go higher when it broke the downtrendline. Therefore, the trader could hold the stock a bit longer. Chart patterns work very well in different time frames. When you learn a chart pattern, you can actually make use of it to trade stocks in different time frames. The pennant can appear in a weekly chart, daily chart, 60 min chart, 15 min chart and even a 5 min chart. The chart above shows the 60 min chart of INTC. The stock formed a 60 min pennant and broke higher. Notice the heavy and unusual volume? 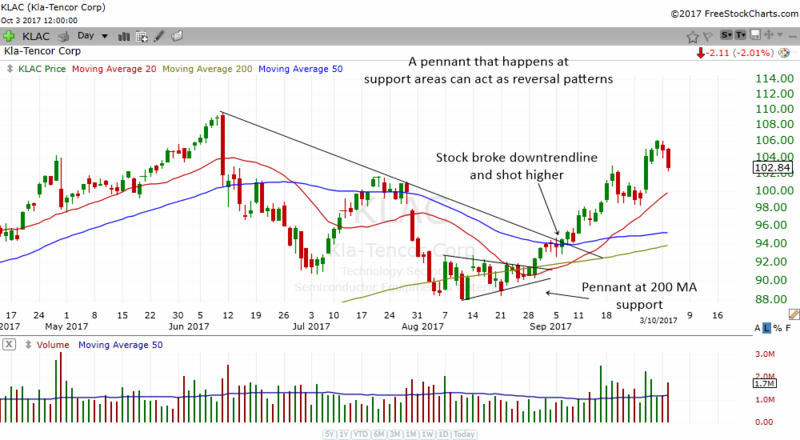 This shows that there are many traders who notice the pennant pattern in INTC and they came in to buy the stock as it broke above the upper trendline. Depending on how aggressive you are, you can put a stop loss at the first low or second low. Note how the previous move gave a nice target for the pennant breakout. The stock has already met the target and traders can sell the whole position or take 1/2 off the table. 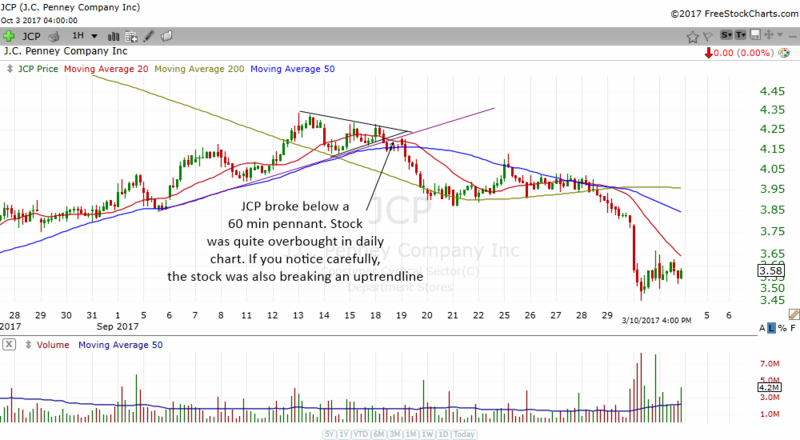 The chart above is the 60 min chart of JCP. This is an example where the pennant acted as a reversal pattern. 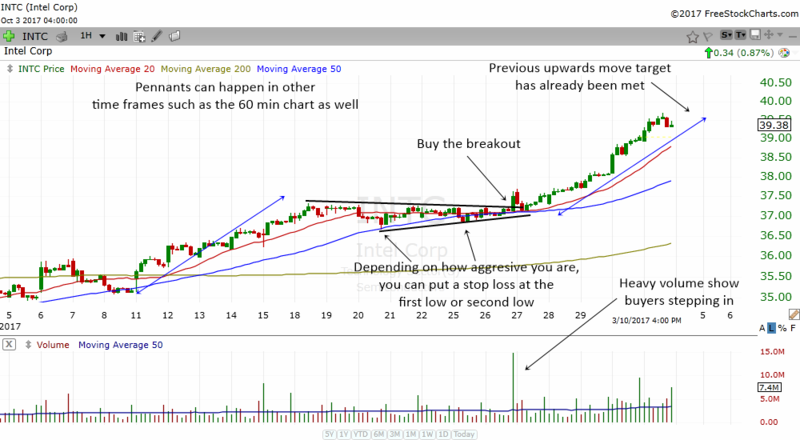 While the 60 min chart showed a pennant, the stock was quite overbought in the daily chart. Thus when the stock broke below the pennant, it started to go lower. If you notice carefully, the stock also broke an uptrendline. The stock also dropped below the 60 min 50 MA. 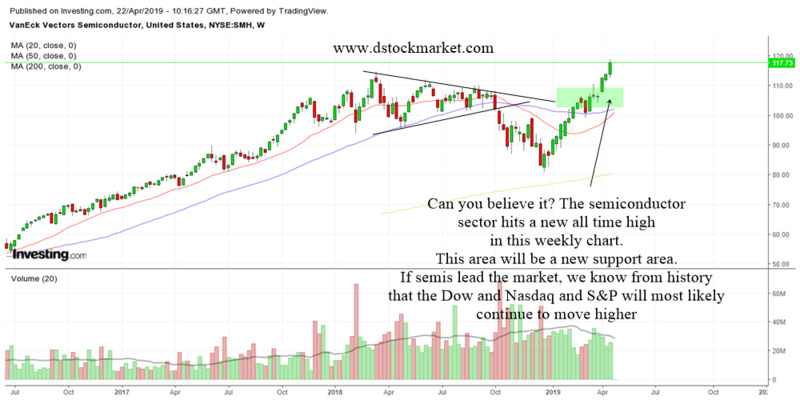 When chart pattern appears when other technical concept happens, this can be a very potent signal to us that the stock may be moving down. The pennant is a very good pattern for traders to make use as a trade setup. Although it appears less frequently than other patterns, they can provide good reward when they work. Learn to spot this pattern and make it your own. You will find it to be a very good friend in the future.